Woo hoo! It’s finally here! The day when Cheesecake Love is available for purchase in stores! Some of you may have preordered it and may have gotten it in the mail already!! Are you excited to get in your kitchen and cheesecake all the things??? I cannot believe that this day is finally here. It seems like so long ago that I was baking all things cheesecake and writing this book. I can’t even tell you how many hours and how many pounds of cream cheese, sugar, and butter went into making this book. Trust me it was a lot! Now the actual day everyone else can enjoy it is finally here. I was seriously in awe when my copy came, and I got to flip through the pages. So what can you expect in this cookbook? Here you will find tips and trick for baking, plus basic recipes like whipped cream, toasted coconut, brownies, pie filling, and more. There are 8 chapters dedicated to all things cheesecake. It is divided into full sized, minis, bars, no bake, brownies, pies, breakfast, and out of the box fun. There is no shortage of cheesecake here. Everything has some cream cheese added to it somehow. Most of these recipes are exclusive recipes, meaning you will not find them anywhere else. I did include a few fan favorites from the blog because they were so popular that I wanted to share them again. But most of the recipes are new and only in the book. This cookbook is available at your local bookstores and these places online. To celebrate this awesome day, I want to share some love with you guys. 5 random winners will receive an autographed copy of Cheesecake Love. This giveaway is open to anyone and will end Tuesday, October 3rd, 2017 at 12:00 pm EST. A winner will be randomly selected from the comments and notified by email. *This post does contain affiliate links. Inside BruCrew Life may receive a small percentage from sales made through these links. As always, these do not cost you any extra. Thank you for letting us share products with you this way. Cheesecake cupcakes would be my first chapter, right up my alley! Congratulations on the book! It’s a good thing this is not a question on a test, because I would have got bogged down in trying to answer and might never finish the test. After going through the book at least twice drooling over pictures, I am certain that I would try a recipe from Cheesecake Bars & Bites. My family loves cheesecake bars–they are pre-cut and easy to grab. The pictures you posted are so wonderful–beautiful and mouth-watering! I’d start with No-Bake Cheesecakes! 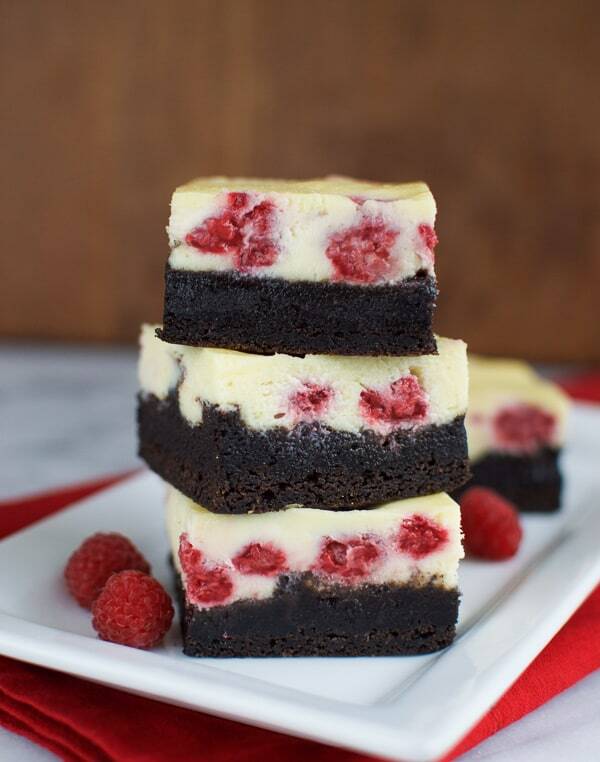 I would start with cheesecake brownies! It’s a great combo! I often cook for a crowd, so I would start with one of your delicious recipes from Full-Size Cheesecakes. Congratulations on your book! Can’t wait to see it! Good for you, this looks so nice and thanks for the giveaway!! And I would go for the cheesecake cupcake section. I’d start with the Cheesecake bars and bites – less guilt in eating smaller pieces! I’d start with breakfast cheesecakes!! First, let me just say, I love your blog! I use so many of your recipes! 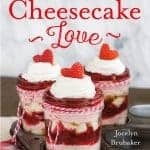 My husband loves cheesecake and I love to bake, so this book would be perfect for us! I would probably start with Cheesecake Bars and Bites! I love making bars! All chapters make my hungry, but especially cheesecake pies!! oh definitely Cheesecake Cupcakes….Can’t hardly wait! So excited! Cheesecake for breakfast! A perfect way to start the day. I would choose to start baking from the chapter entitled ” Cheesecake Bars and Bites” I am always looking for delicious bars to take to potlucks and for Bible Study treats. Out of the box cheesecake desserts, of course. Because anything that says fun catches my eye first. And hopefully means fun things to make with my grandkids. I’d start with Cheesecake pies!! I’d start with the cheesecake brownies! Congratulations! Bars so I can freeze some for later. What a fun book! Definitely full size cheesecakes. I have so many different shaped springform pans I love to play with. Congratulations!! Full size cheesecake! Lovely cookbook! Congrats Jocelyn! SOOO exciting! Def Full Size Cheesecakes! LOVE Cheesecake! I would start with Cheesecake Brownies! You can’t go wrong with that combination. Cheesecake bars and bites because I’m always looking to take something to a potluck and everyone loves cheesecake!! The last one! Out of the box cheesecakes! The more adventurous the better!! I would start on full size cheesecake, Larger than life. Congrats on the book. Breakfast Cheesecake? What? That’s where I would start! I would start with the no-bake cheesecakes. I am trying to use my oven less during the heat of summer and fall. Full Size Cheesecakes! The bigger the better!! I would start with Cheesecake cupcakes. Breakfast Cheesecake. If I can start the day with a delicious sweet treat and have it include cheesecake, then I will. Cheesecake Pies…I love a cheesecake and my hubby adores pies, so this chapter would unite both our tastes! So hard to decide! 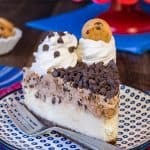 I guess I would flip to bars and bites but cheesecake pies have me intrigued! Full Size Cheesecakes – More of a good thing! Congratulations on the book release! Thanks so much for the giveaway. That’s a hard question to answer…my family loves cheesecake. I think it would have to be either Cheesecake Bars & Bites or Cheesecake Brownies. YUM! Cheesecake Bars & Bites sounds like the perfect place to begin for our household. Beautiful book! Cheesecake bars and bites would be my first chapter! Congratulations on the book! Cheesecake for breakfast sounds like a winning way to start my day!! Cheeecake pies would be my first choice…excited to see and try all the great recipes in your book! 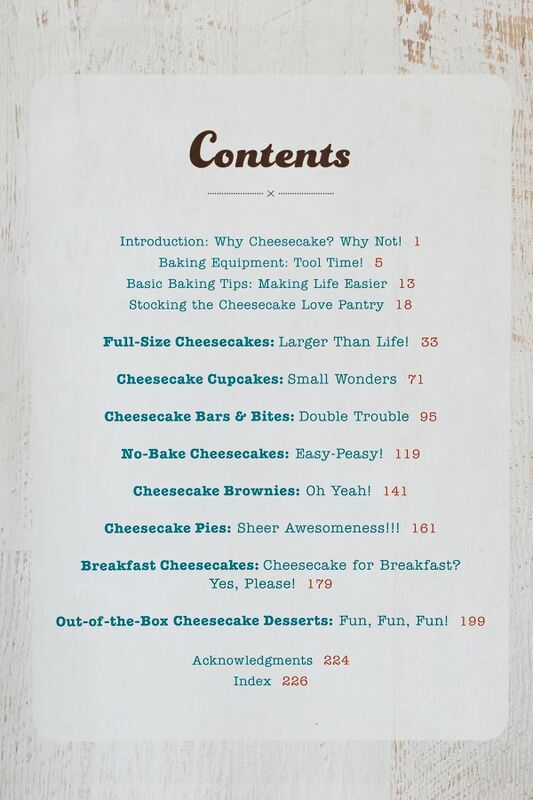 I think I’d start with the Full Size Cheesecakes, but every chapter looks enticing! The out-of-the-box chapter! Sounds too enticing! Cheesecake Cupcakes (hooray for compound words, lol)!! Cheesecake Cupcakes–so I could easily share them at work. I would have to start with Cheesecake pies. The chapter I would start baking from first is No-Bake Cheesecakes. So excited for this. Congratulations on the book !!!! Woohooo !!!! Congratulations, Jocelyn!!! The photos you shared are irresistible, mouthwatering, and should make it impossible for someone to not run out and buy your book immediately! 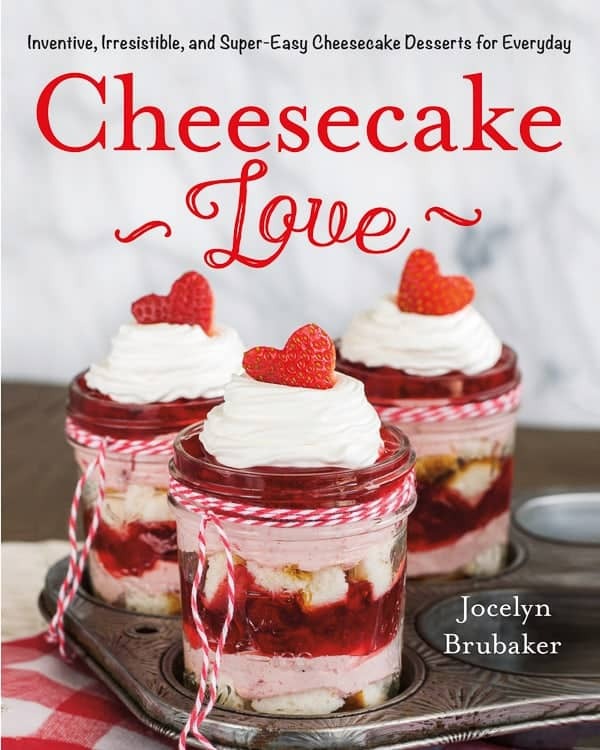 I adore all things cheesecake, so I know this cookbook is for me! Cheesecakes pies, oh my…..what a wonderful cookbook. I would want to try the Breakfast Cheesecake chapter!! I have not a clue what is in that part but I am ready now to dive and try those recipes!! And I’m sure my husband will not complain one bit!! This book sounds like so much fun! GOOD LUCK EVERYONE! Full-Size Cheesecakes! Why have less! Congrats to your book! Breakfast cheesecakes…..you know, starting the day off right!!!! Congrats! The photos are beautiful -yum! Congratulations on the book….it looks amazing!! I would have to start with Full-size Cheesecakes. 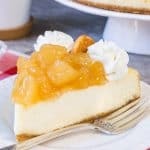 My husband’s birthday is just around the corner and cheesecakes are his favorite so it would be fun to surprise him with a brand new recipe! Thanks for the contest, but more importantly for inspiring me to follow my heart and my passions. I would start with cheesecake bars and bites. Perfect to share! Cheesecake bars & bites would be my first choice. This way I could definitely have more then one and not feel so bad. Ok maybe not the best plan but the sweetest plan for sure. Congratulations on your book. They all sound wonderful! I would start with the cheesecake brownies!! Congrats! Seeing as my husband’s favorite dessert is indeed cheesecake, I’d start with Full-Size Cheesecakes! Oooh, Cheesecake Pies sound interesting. I would love to start there. Breakfast Cheesecakes! 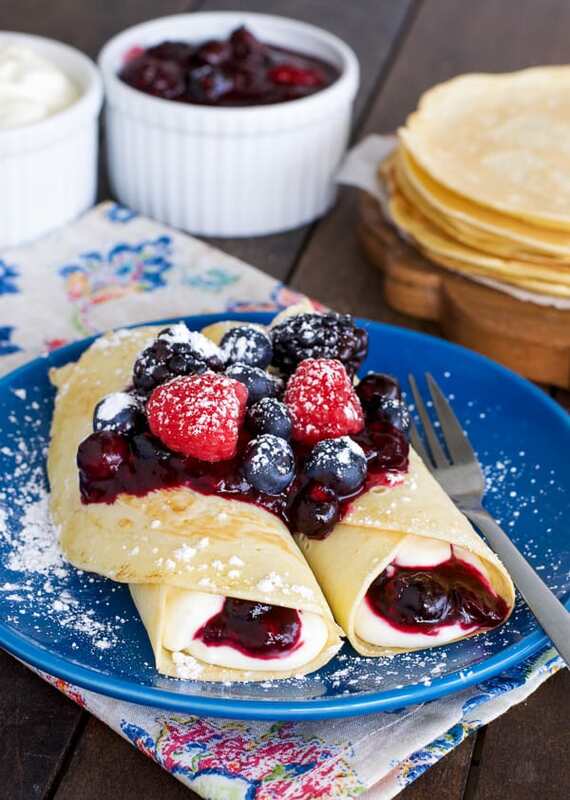 Those crepes look amazing. It’s hard to choose, but I think I’d start with cheesecake bars and bites. All the chapters sound amazing! 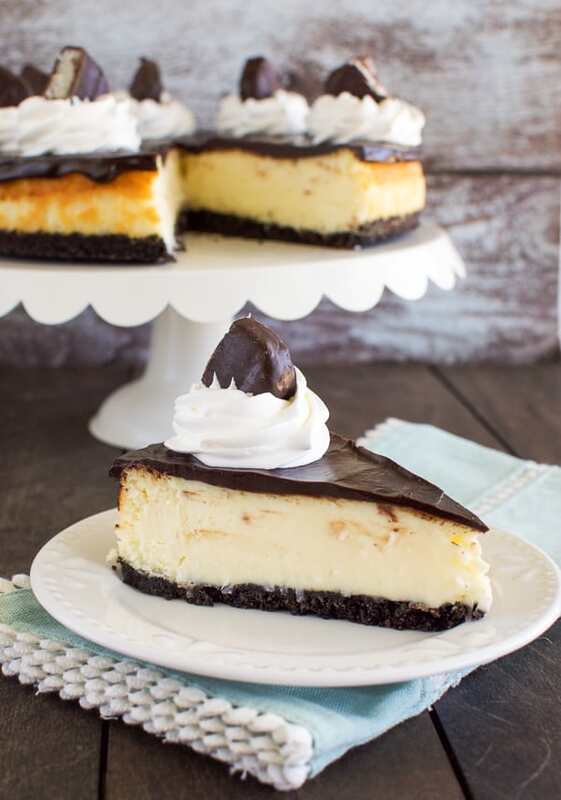 I would start with Cheesecake Pies because I’m thinking they would be faster to make than a regular cheesecake, which means I could eat them sooner! Congrats on the the cookbook! I’ll start with Cheesecake Cupcakes. I loved the layers of flavor, texture, and color you combined in each recipe creation! So excited to flip through the book! Full size cheesecakes first then go down the line and try a variety congrats on your book ! What better way to start than with Breakfast Cheesecakes. I think I would have to start with cheesecake bars & bites, but I have a feeling I would eventually work my way through the whole book! Yum! I’d go with No Bake Cheesecakes! I love quick and easy. Thanks for creating such a great cookbook! Full size cheesecakes! Start at the top! 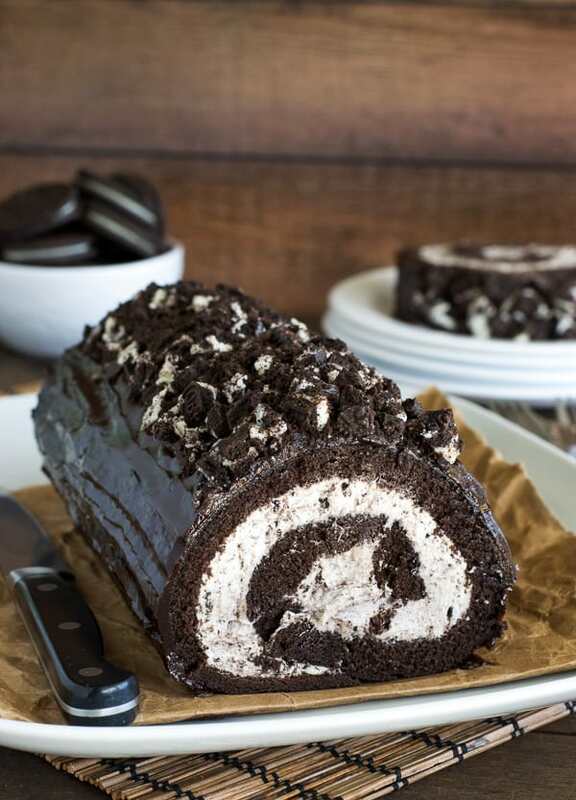 I would start with full size cheesecake chapter, would love this! I think I would begin with the Cheesecake Cupcakes and work my way through the rest of the book. The chapter titles look like a fantasy for me because I really LOVE cheesecake. Thanks for the opportunity and congratulations on the book! I would start with cheesecake pies. 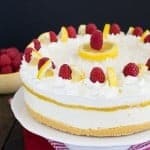 My son want a funfetti cake for his birthday every year, I think he would love this cheesecake! No bake would be where I’d start but that sprinkle one has my attention!! Congrats!! They all look so yummy. 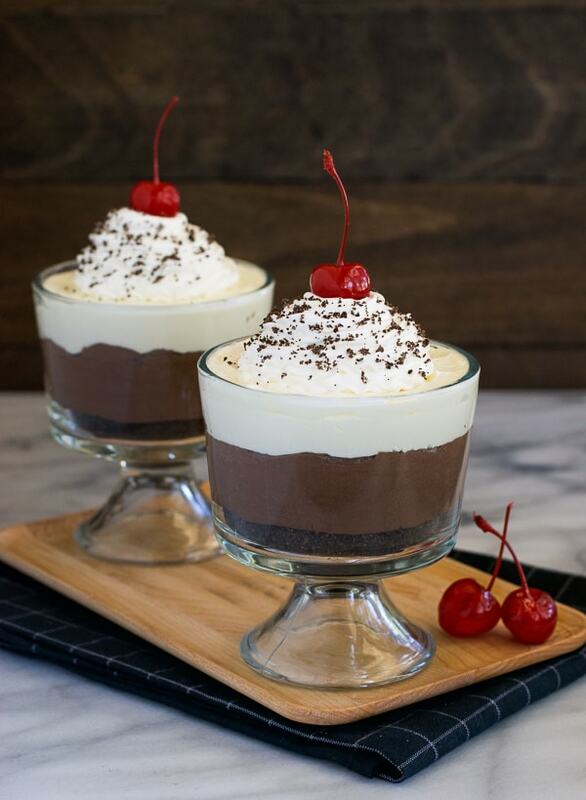 I would start with no-bake cheesecakes! What a hard question! 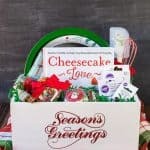 I’d likely start with “Cheesecake Bars & Bites”, they tend to be a little more portable and shareable than a whole cheesecake– I’m sure my friends would love to help me try them out! I would definitely start to make every recipe in the cheesecake brownie section – two of my favorite desserts in one! Yum! 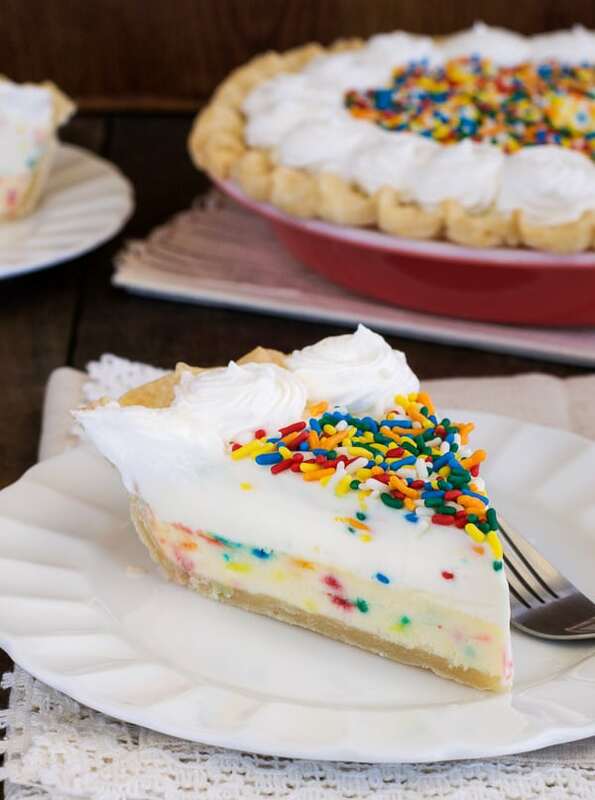 While all chapters look and sound delectable, I would go straight to Cheesecake Pies… but only because I am a sucker for all things rainbow and the sprinkles sold me instantly! Yum! Oh, definitely Breakfast Cheesecakes! Yum! I would definitely start with the no bake cheesecake chapter. I would start with the no-bake chapter! Out of the box FOR SURE! How fun! The only thing better than cheesecake is cheesecake incorporated into other desserts! I would start cooking from Cheesecake Brownies. Oh yeah! I would start with cheesecake cupcakes for sure! Yummy! I am just sooo thrilled to get this, and intend to give this special, precious cookbook the awed respect it gets from me, by baking every single recipe in the book one-by-one, like the movie Julie and Julia…cant do one a day, but will see this joyous journey thru every delicious bite there is!!!!! Congratulations!! I am so happy for you!! I can’t wait to see it! I’d start with the no bake cheesecakes! It’s hard to choose just one. I’d probably start with Cheesecake Bars & Bites. In my family we do a fruit salad that everyone loves. I do love a caramel cheesecake with a chocolate crust… Might have to make me one for my birthday..